It's all over! The romantic taxi switchings, clandestine meetings at the zoo, coded rings on the telephone, cryptic ads in the personals, wrinkle-proof dresses, rented cars for motel parking, all the extra staterooms gone to waste, all the unused beds disheveled for effect, the countless, selfless, thoughtful little cautions that made the affair so special, so sweet, that so often assuaged the fears of retribution from legal mates and bolstered weak yearnings into lust. Well, it is all over. The End. From this day on everybody gets caught—provided someone, somewhere, cares enough to catch. Like omniscient gods returned to dun us all, the new listening bugs are now so pervasive and available that the most extraordinary exercises in old-fashioned caution are futile gestures against them. The new ready-or-not-here-I-come transmitters have turned ironclad alibis to clay. The latest in these new bug-your-baby spying sets, require no electronic skills and come in a variety of disguises. A multimillion-dollar industry that supplies these bugs has grown where dusty radio shops once tested tubes. Its economic rise is shaking the foundation of contemporary American infidelity. Philosophic considerations have no place in these new snoop-kit shops where husbands, wives and lovers have a twelvemonth season on each other. It is, after all, perfectly legal to fill your house with taps and bugs, peekaboo doors, hidden mikes and two-way mirrors. However, the cumulative effect of just these invasions, the knowledge that the phone you dial, the pen you use, the painting you admire, the bra you squeeze, the dart you fling, and even the mattress you lie upon may be bugged, has turned many a vamp blood-shy. "Look! They come straight in off the street. 'I've got a maid problem,' they'll say. 'She's robbing us blind.' They make it 'we.' It's supposed to throw us off. 'Do you have anything we can keep in the house so we will know what she does when we're away?'" The Continental Telephone Supply Company at 17 West Forty-sixth Street in Manhattan specializes in these problems. "Nobody wants to tell anybody the truth about anything," one of the salesmen pointed out. "It's the law of nature." "We like to ask them what they want the bugs for," Continental's thirty-two-year-old president Ben Jamil says. "We wouldn't want them listening in on the President's phone calls or plotting out his parade route." That electronic spying is Big Business among Big Businessmen is nothing new. The New York Times reported on November 28, 1965, that "Industrial espionage is now a standard part of the strategy of business." What is surprising to many, however, is the newfound popularity of the revolutionary do-it-at-home bugs, which are so easy to operate, so simple to buy and so impossible to deceive that even the idly curious and lazy are using them. 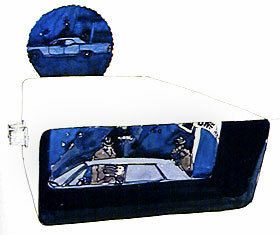 "Investigative Accessories," reads a sign in Continental's frantic display window. Inside, neatly stacked on shelves and benevolently pulled out for shoppers as though they were trays of wedding rings are tiny microphones that can be slid under doors, dropped out of windows, and nailed into walls. There are microphones that look like fountain pens, cuff links, tie clasps and belt buckles. 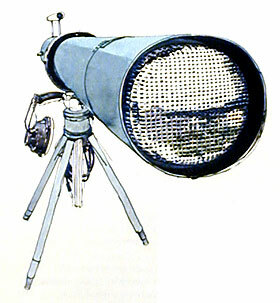 There is even a shotgun microphone "that can be aimed like a bazooka for long-distance monitoring." Some salesmen tout customers away from the shotgun: "It has lots of limitations. Sure, it has a range of about 3,500 feet, right through the window, but it's cumbersome and a bother to record from. Planting one of the tiny transmitters in a coffee cake or putting a cavity mike in the clam chowder would be a lot easier and not much more expensive." For the wireless-at-heart there are the transmitters. 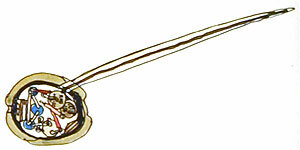 The "micro-miniature 006 transmitter" is smaller than a postage stamp and costs $125 ("It picks up whispers across a large room); the $25 fountain-pen ("it can pick up a sand crab scratching fifty feet away"); and the world's smallest transmitter ("the false tooth," or cavity, invented to be hidden in a drilled-out cavity or set of false teeth). Then there is Continental's specialty of the house. "Presenting the most modern and efficient attach� case. Containing a voice-activated recording system; starts when there are voices; shuts off when there is silence; concealed microphone; nature lovers can record bird and animal sounds undetected. Allows up to twelve hours of recording time per tape." The thickest "nature lover" would have to realize that an attach� case from Continental in a bedroom closet could effectively record just what happens to the mice when the cat's away. There are also decorative devices for the ladies. One of Continental's fasted moving items is a $150 table lamp called "Whisper Light." It is just the sort of thing a woman might buy to use in her own home or send to a friend. The lamp can be wrapped and mailed to its victim as a gift while the radio-tuner, which picks up its transmissions, and the voice-activated tape recorder go home with the buyer. "Not even your decorator knows for sure," boasts Continental's ad. Jamil adds: "Whisper Light functions just as well whether it is turned on or off, and it can be adapted to work whether or not it is plugged into an electric outlet, left bulbless in a closet or even dismantled. The lamp is the transmitter, that's why you can never turn it off." "I really felt the dresser needed a little something, dear." "I mean it looked so damn bare." "Anyway, we needed the light." "Good! I'm so glad you like it." The one technological achievement which wrested "listening devices" from the ears of the professionals and dumped them into the laps of the amateurs was the voice-activated tape-recording mechanism. Without it, a twenty-four-hour monitor was needed. The spy movies of the Forties were full of agents named Jenkins who could never take off their headsets. Today, however, a squeal, giggle, laugh, groan or sigh is all that is needed to start the recording process. "You've got no dead air on the tape. If you've used up a twelve-hour spool, it means you've got twelve hours of indictable sound," the salesman promises. Though these instant-spy kits are complicated devices, their application in the home is explained to purchasers with comic-book simplicity. 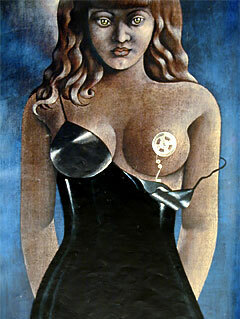 In the first panel the wireless transmitter is shown concealed in a clock radio. Broken-line arrows reveal that it is overhearing everything in a room. The second panel shows a zig-zag of transmitting lightning, across a star-filled night and above a tiny skyline, which connects the first panel with the third—a book-lined study with a portable radio on a desk. Bent over it, a smoking-jacketed man is about to get his ear shot full of familiar broken-line arrows. There is no way of knowing just how many people have bought Whisper Light, had it gift-wrapped and mailed to unsuspecting neighbors, relatives, bosses, paramours, gigolos and estranged mates. "How nice of Mr. Money." "This chick I'm ballin' sent it." By specifying the style the sender obviously has some control over where in the house or apartment the lamp will be placed. 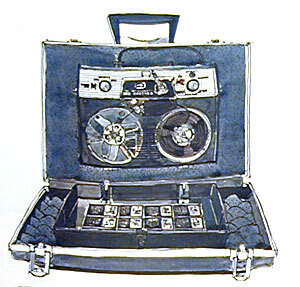 With the voice-activated recorder attachment the listener can come home after a day's work and play back the spool of sound recorded during his absence. The entire price for this arrangement is just under $500. Continental's owner is quick to admit that he does not know how any of his bugs work. Jamil thinks of himself as a salesman who can hire engineers. He has offices in Lebanon, Rio and London, as well as eleven retail outlets throughout the U.S. He says: "Five years ago I started out so broke that I needed a comaker at Chase Manhattan for a $100 loan. Now we gross four-and-a-half million a year in security equipment alone. In this business I've found everyone wants to snoop on his brother, you know, I am my brother's snooper." Under Jamil's second-floor office, overweight ladies carrying shopping bags slide in, pale men, carrying their horns like halos, nestle up to a counter and casual inquiries are made. It is hard to believe many of them could possibly care. For those serious enough to bring cash, hints of ideal locations for the placement of bugs are passed along during the small talk which accompanies every purchase like Hollywood background music. Preferable spots for transmitters, one learns, are the rear of desk drawers (no one ever looks in the very back of a drawer), inside upholstery, under beds and in mattresses. 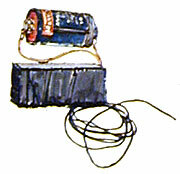 Long-term bugging is better when connected to an electrical device like a lamp, television, clock or French phone, in order to draw permanent power. More than six thousand French extension phones were given away as gifts recently, according to Jamil; some of them contained transmitters. One turned up in a European royal palace. Where a suspicious wife or cuckold (what a marvelously archaic word) might take Continental up on its offer of simple-to-operate, easy-to-buy bugs, many of the professional detectives go to the master bugger of them all. Emanuel Mittleman occupies a sloppy I-know-where-everything-is kind of office in lower Manhattan: "I always like to get someone's particular particulars," Manny starts conversations. "You've no idea how many nuts wander into this place." Operating in a building one block from the Hudson River, Manny Mittleman invents, creates, devises, inspires and is in the end a captive of his own fascinating and tiny creations. He will hold them in his fingers like jewels, rotating them slowly on his stubby fingertips, focusing the draftsman's lamp, adjusting the swiveled magnifying lens, beckoning an observer closer. "Look at that! Look at it, how beautiful, how clean! You don't see work like that. You've got to know what it means before you can know how beautiful it is." His transmitters, under the lens, are yellow pods and silver wisps of wire, stuffed into small plastic boxes drilled full of holes. Manny's specialty is a device which allows eavesdropping on someone thirty-five hundred miles away. There is no law against selling this $400 invention, which he calls "the harmonica bug." There are definite and very specific laws concerning how and where it is used. Private detectives who get involved with the planting of these, or even less exotic bugs, are chancing jail. Therefore, the older and highly reputable detective agencies deny the use of bugs and reject requests for illegal taps. There are, however, enough keyhole specialists who can use the money. Manny's ingenious harmonic bug uses the telephone as a source of permanent power. Its installation, a matter of two minutes for a professional, does require some skill and is therefore never used by the kind of people who buy Continental's catch-'em-in-the-dark attachè cases. Manny, who is most proud of the fact that the harmonica bug is made up of more than two hundred hand-soldered joints and is the work of a craftsman, explains: "Say the telephone right here in my room was tapped with the harmonica bug. Well then, the guy who tapped me, even if he was somebody across the country, would just have to dial my number and before my phone rang, blow into this specially-tuned harmonica and activate the bug planted in my phone and pick up everything we said within fifty feet of the phone, even though it's hung up like now. "This one really works best," he continues, "when you know that there's a meeting you're not supposed to know about. Well, then you just call that person up on the phone you've bugged with the harmonica bug and chat with them by asking all kinds of leading questions. They'll be too smart to talk on the phone, but as soon as you hang up they'll tell the others present everything you said. The only thing is that you don't hang up. When you hear him click off you blow the harmonica into your phone and from then on you can hear everything they discuss in the room. You know, nobody suspects a telephone resting on a cradle. It's the most harmless thing in the world." Years ago, before these electronic killjoys, an illicit romance had a chance. Today, everybody is victim as well as prisoner of the new bugs; in order to escape them, we must turn to their cousins, the jammers—nothing else will suffice. "I wear two hats," Continental's Jamil will say, his large brown, suspicious eyes checking the corners. "You come in and want to record something, I can help you. You come in and want to stop someone from recording you, I can help you." Jamil first shows a debugging device which lights up when a transmitter is operating within its range. It is called the "anti-invasion-of-privacy device" and costs $250. "A lot of people who do not themselves bug others will think nothing of making certain that they are not bugged themselves," Jamil says with a twinge of wonder. "Where we run into trouble is when we wind up in the cross fire. A Brooklyn doctor came in a little while ago and bought $800 worth of bugging and listening devices for his waiting room where patients, he said, often mentioned symptoms they would not mention to him. Three weeks later some lady comes in and says her sister is a nut and her psychiatrist said to record her ravings. She walks out with about $650 worth of stuff. Two weeks later our doctor returns and says somehow or other his patients know everything he is doing. So we sell him a jamming device, another $200. Two weeks after that the lady comes back and says she needs better equipment because she's getting a lot of static from her crazy sister's room. We make a check. They're married." Desks can now be outfitted with anti-invasion-of-privacy units which light up when a transmitter or recording device is brought within the room. There are other jamming units which create a static situation on the airwaves, rendering transmission unintelligible. There are now men who are working on a dejamming device which will not only clear the air, but very likely clear the decks for an anti-dejamming device. The State Department, which is very good at this sort of stuff, has devised a prefabricated room for setting up within another room in our big-plagued embassies. It has four walls, a roof and a floor and rests on four solid, soundproof legs. It is quite clear that the future holds even greater privacy invaders to be dealt with. Aphasia, the pathological refusal to speak, might easily become the "camera-shy" of tomorrow. But no matter what countering devices are created, the fact that they are necessary, that they must not be forgotten—I'd love to, dear, but I left my jammer at home—will continue to inhibit spontaneity, the sworn enemy of social order. The cautious lover will soon arrive, his arms filled with flowers, champagne, pep pills and jamming devices, debugging units and transmission detectors. Tomorrow's lover, if the present trend continues, will look something like today's television repairman. "He that hath ears to hear, let him hear," quoth the Bible. He hath and he doth and you're the victim. The devices on these pages are not from a TV show. They are for real, for sale, and for anyone who cares enough to want to learn your secrets. If none is now being used against you, you must be a man of small means, little power and no interest whatsoever. Take no person into your confidence, because, as the two of you sit and talk, your words might be sent forth on the air waves or set down on magnetic tape. Your adversary needs a concealed microphone—a simple prerequisite, transistors being as small and powerful as they are. At top left is a mike disguised as a cuff link. Below it is another inside a fountain pen. 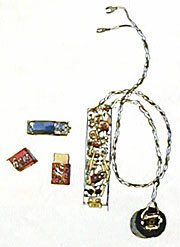 Both these devices must be attached by wire to a small transmitter such as the one shown at left inside a cigarette box. This one, called the 0007, could have a short aerial, has a pearl-like knob for selecting an FM band. Your voice can be heard elsewhere by an accomplice with a receiver. 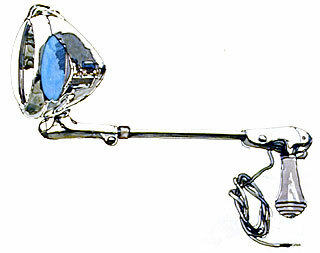 The martini-olive microphone with transmitter has attracted a good deal of attention in the press, was mentioned in a Senate hearing on bugging devices and is de rigueur in spy films. 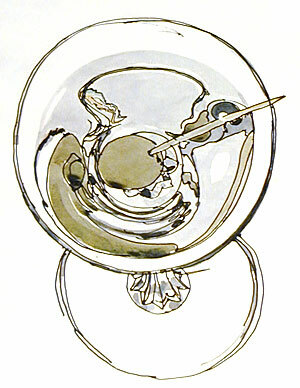 The mike is at the left end of the olive, where the hole should be, and the aerial is concealed inside the toothpick. Actually, this is too expensive ($200), too low-powered and gimmicky for a real pro. Its range is not more than fifty feet, and an operative would need his receiver and tape in the next room. Nevertheless, smart hostesses dispense twists of lemon. A room bug by Emanuel Mittleman. 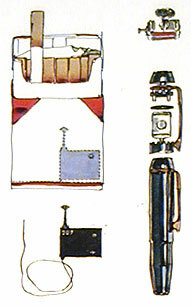 The battery (top) provides power only when voices are heard near the little box (bottom), which can be hidden in a drawer or among the draperies. The aerial transmits voices for blocks. Clever, unscrupulous operative. He has managed to secure a room next to yours and you don't suspect. You're a sitting duck. 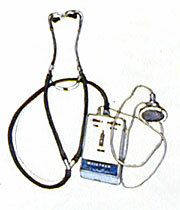 He can apply the listening end of this stethoscope-like device to the wall and hear your every word and move. The transistorized amplifier makes even the faintest sounds audible. It sells for $100. Maybe there is someone who wants to know when you have entered your home or your office or wherever it is you go. So he puts a fine wire along the woodwork in your room and attaches the wire to this device, which he hides in your basement or attic. Your body heat will activate the wire and set the mechanism, above right, in motion. An arm begins to dial the phone and keeps at it until your foe answers (it can dial six preset numbers), thus notifying him you are where he wants you. By now you should know enough to avoid people with attach� cases. Still, there is a big market for this sort of thing, and the price can be $400 and up. There is a microphone hidden in the handle. When someone lifts the left-hand clasp, the thing turns on, the tape reels whirl, and up to sixteen hours of talk can be immortalized. The thickness of the case ensures silent running. Some models come with a compartment to conceal the tape recorder. That disloyal employee at the conference can thus open up his case, take out his papers, and never once interrupt the recording of what you had hoped to keep confidential. Emanuel Mittleman's harmonica bug is the most extraordinary listening device anyone can buy. 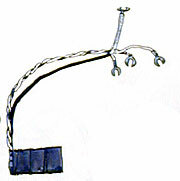 It is seen, at right, attached to a small mike. All this fits in your telephone and connects to its wires. The tiny harmonica, with its box, is carried by the man who wants to listen in on you. It is taped up so that it will sound one note only. The eavesdropper dials your number and toots the harmonica before your phone rings. Your phone then doesn't ring but becomes a bug you'd never suspect. Anything you say within its vicinity can be heard by the caller, even if he has dialed you coast-to-coast. You'll fix them, you say. You'll hold a meeting outdoors, in an empty field or on the beach where you can watch out for snoopers. Don't forget this device. It gathers in sound waves and amplifies them a million times. Even the lightest model can pick up ordinary conversation five hundred feet away. 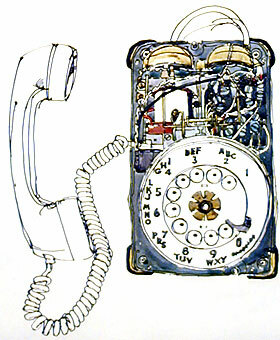 Would you spot a phone bug if you took your telephone apart? You see one above, wrapped in the tape and resin Mittleman uses to conceal his circuitry. You see at left where it fits in the phone—under the figure 4 or thereabouts. It automatically records everything you say or is said to you. No one knows how many such are now at work. Closed-circuit TV keeps watch, as you know, in banks, foyers and public places—and also, perhaps, where you least suspect. The camera above is only a foot long and can be neatly hidden or placed behind a one-way mirror. It's costly but highly effective for someone who would like to know exactly what you do when you think on one is looking. Tie clips are in fashion and no wonder. They provide one of the neatest ways to get your off-the-record comments onto tape. 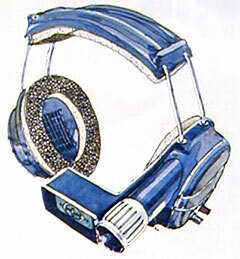 The mike sits out in front, encased in the jewelry. 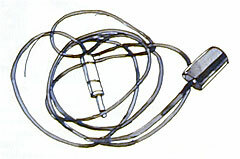 A cord runs inside the shirt to an FM transmitter carried in a pocket. It's not polite to ask a visitor to strip. Better advice: keep your mouth shut. This is a heavy-duty, medium-to-long-range transmitter. A microphone can be concealed in a room and then plugged into this device. Once installed, it will broadcast on several bands continuously (but not simultaneously) for a week. 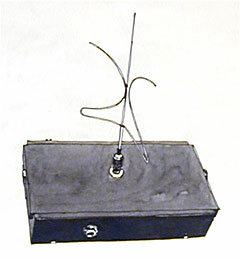 The antenna is called a Tri-ant by its inventor, Richard N. Morgan of Hermosa Beach, California. Here, at last, there may be some hope for you. This is a radio-frequency indicator, and you should carry one with you wherever you go. You pull up the antenna, twist the dials and move the device slowly around the room. The needle will tell you if the room is being bugged and on what frequency the hidden transmitter is operating. You can purchase these things at most of the places where you buy mikes and transmitters. Rest assured that your adversary has one, too. So think twice before you decide to bug back the person who is bugging you. At one time, servants were wont to listen at doors and peer through keyholes. Today's operative scorns such crude techniques. However, this tiny tube microphone can be pushed into a keyhole or through a small hole drilled in a wall. It picks up and amplifies even furtive whispers. It is usually connected to an audio amplifier and earphones, can also be plugged into a transmitter. You're in a room talking to a really trusted friend and no one is within ten miles of you. You lose. The portable laser microphone (left) emits an invisible infrared beam no bigger than a pencil. This beam goes through your glass window and bounces off the mirrored modulator (above), hidden there for the purpose. The beam goes back to the source altered by the sound waves you produce in the room. Miles away a photo amplifier is able to decode your words. The Morgan Geo-Phase mike has a range of three hundred yards and is handy in noisy places. Someone eavesdropping on you puts this over his head and pinpoints you with the crossed hairs of the sighting mechanism. This "aims" the mike, which will then accept only those sound waves falling directly upon it in line with the axis, i.e., your words, no distractions. It's an automobile spotlight. But inside: a Doppler radar microphone hooked up to the car's radio. The car is parked miles away from your house, but in line of sight of your window. A narrow band signal is bounced off the windowpane, which vibrates as you talk inside. The driver hears what you say. Though darkness hides you, someone is watching. 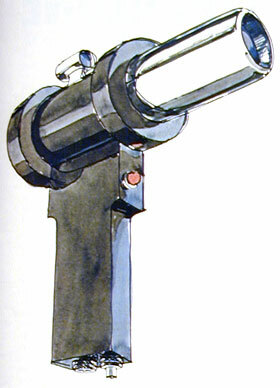 Richard N. Morgan has a device he calls the Owl's Eye, which takes available light and electrically amplifies it to produce an image with the brightness of noonday. It's small enough to fit in a man's hand. 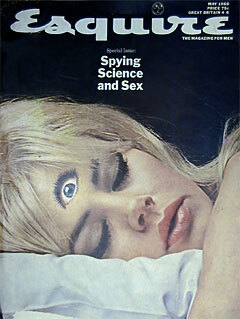 If that man is following you, he now knows what you do in the nighttime. 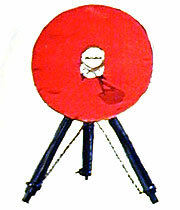 There are several designs for mikes mounted on tripods and aimed like guns. Some of them have a range of two hundred yards. It would appear such devices are pointed at you from everywhere. You have no recourse but your own glum thoughts. Hold on. Honeywell, Inc. is working on a method to reach inside a man's mind and control his brain waves over great distances. Happy days!